Noel Barrick, AIA, a 1966 graduate of Sherman High School, is the principal-in charge and the project manager for the new Texoma Medical Center. He is a principal with HKS, an international architectural firm based in Dallas and has been involved in managing more than $1 billion in healthcare facilities. TMC is not Barrick’s first rodeo. “I’ve been involved in healthcare architecture for 35 years and have projects from coast to coast, including The George Washington University Hospital. In an emergency, this is the hospital that serves the President of the United States. This was an interesting project, as we worked with the secret service, and it was a fairly complex project, but coming home and being involved in a facility that serves your community tops it all. I can’t explain how excited I am about this project,” admits Barrick. In addition Barrick has donated the architectural services of HKS for the design of Reba’s Ranch House that will be constructed near Texoma Medical Center. “We were working with the staff on the design of the Reba Ranch House and I was informed that Honey Minshew was the co-chair person of the development committee of the Texoma Health Foundation responsible for Reba’s Ranch House. Honey and Bob Minshew were my next door neighbors many years ago, and my wife babysat her children. It’s just incredible and so rewarding to me personally to be able to give back to my home community,” said Barrick. Barrick’s wife, Jeannie (Wilson) Barrick, is a 1969 graduate of Sherman High School. “We still have many friends and relatives in the Denison and Sherman community,” she said. 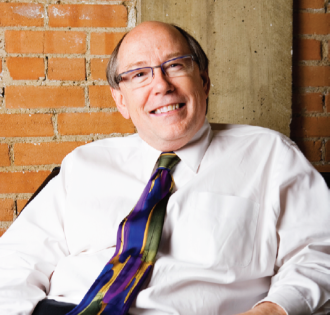 After high school, Barrick earned a Bachelor of Architecture from Texas Tech in 1972. He joined HKS in 1977 to help establish a new healthcare practice for the firm. Today, the award-winning group is flourishing with more than $10 billion in construction underway. HKS ranks as the top healthcare design firm in the United States in terms of both volume and value of healthcare architecture completed annually.